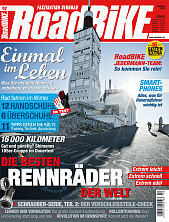 I recently picked up the latest issue of the German cycling magazine RoadBike (yes, it is German in spite of the title!) primarily for an article about cycling in the Marche area of Italy but I enjoyed another story "Einmal in Leben," ("Once in a Lifetime") which is a list of all the things a cyclist must do before finally stepping back from the podium, so to speak. Being irrevocably middle-aged, I thought I should be Germanic and make a list of what I have already done from this list before time runs out. Check. Was there in 2005 and again in 2008. Check. Even better than this, in 2009 I won a sprint to a country-limit sign (from Austria to Germany). Check. Three times so far! I can't figure out how to do this as without a license plate the authorities cannnot track me down. I did once exceed the speed limit on Skyline Drive in Virginia and was pulled over by a policeman with others from the Potomac Pedallers. No ticket though. Check. Done in 2010. An extraordinary experience. Not yet but I plan to do it within the next two years. Check. The Sella Ronda route is definitely a must-do and I did it in 2009. Check. Twice in Mallorca, twice in Nellysford, Virginia with Squadra Coppi, once in Sicily, once in San Diego and once in North Carolina. My excuse for not doing this is that the registrations sell out instantly. Luckily. 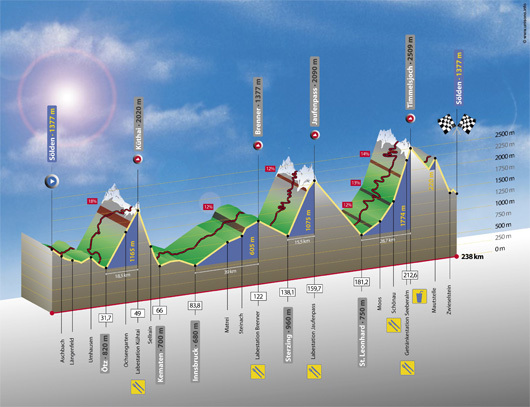 There is no way that I am doing a 238 km ride with 5500 m of climbing. This is insane. Look at the profile! Not yet. My two trips to Mallorca did not include this but I would still like to do it. Check. Twice in Kaarst-Büttgen seriously and once in Cologne just to say I did it. The list should include seeing at least one Six Day Race. Check. In addition to riding the Mountains of Misery long route three times, I have completed "Radmarathons," as the Germans call 200+ km rides, often in Germany, as well as the 220 km Eleven City Tour of Friesland in the Netherlands. My one attempt at a 300 km ride, the "Animalthon" in Ontario, failed after 180 kms due to terrible weather. So that is still on my list. Check. The 2008 Lost Boys Tour did the Route des Grandes Alpes, surely a monument of cycling. I am looking at other routes, particularly the Via Claudia Augusta, which would take me down into Verona. Check. Too often. The worst was probably riding the infamous SkyMass ride in 1999 with my friend Jeff and we were both totally blown at the end. Check. Done in 2002. Well, most of it since I had to walk part of the middle section. This is one of the many famous stretches of the Tour of Flanders and it is a genuine relief when you see the chapel at the top. Check. Done in 2011 and wanted to do it again but it sold out too fast in 2012. They are going to a lottery system for 2013 so there is still another chance. A wonderful ride. Not too bad so far: of the 15 on the list, I still have only to ride in Mallorca again and take a shower in Roubaix since there is no possibility of doing the Őztaler and I am baffled by the photo radar problem. A man's gotta know his limits.